We live in an age where everyone is considered a “Christian.” You can claim to be a Christian without reading the Bible, knowing the Lord, or accepting Jesus Christ as your Lord and savior. You can be a “Christian” today and yet have no fruit whatsoever to prove that out. Then those who call themself a Christian and yet have no fruit, do not live their life according to the Word of God, who do not follow the Lord Jesus Christ – then they attack those who truly are Christians. These people, perhaps Christians, are yielding to the devil and allowing the devil to operate through them. Just last week you had this happen center stage in our nation. Famed singer Lady Gaga decided to open her mouth and attack Jesus Christ from the stage during one of her concerts. She riled and cursed Jesus in front of her audience that apparently feels the same way. She stood up and yelled out about Vice President Mike Pence. “You say we should not discriminate against Christianity [speaking of VP Pence]— you are the worst representation of what it means to be a Christian,” she said. “I am a Christian woman and what I do know about Christianity is that we bear no prejudice and everybody is welcome,” she said. Did I say she attacked Jesus earlier? I did. That’s because that is exactly what she did when she attacked Vice President Pence. Remember Saul on the road to Damascus? Jesus appeared to him and asked him why he was persecuting Him, speaking of Jesus. Jesus didn’t think that Saul was persecuting the church or a Christian. No, Jesus considered it a personal attack against Himself. That’s the first thing we should remember. When someone attacks you for being a Christian, they aren’t attacking you – they are attacking Jesus. And did I say that these so-called Christians were allowing the devil to operate through them? Of course I did. Remember when Jesus was telling His disciples that He was going to die. Peter tried to tell Him that He didn’t have to go and tried to stop the plan of God. Jesus replied to Peter – “Get behind me Satan.” He called Peter Satan. He called him the devil. In fact, He didn’t say the devil was operating through him. He straight up called him the devil. I’m not saying that the devil actually manifested himself through Peter, but he sure did yield to him. And when these people, whether they call themself a Christian or not, start attacking Christians that are standing for the truth, they are yielding to the devil. Today we have a lot of people trying to tell Christians what it means to be a Christian. We have a bunch of heathens that wouldn’t know Jesus if He walked in the room with a red cape and top hat on doing cartwheels. We have a bunch of people following after something that they call Jesus, following something that they call the Gospel and following after some spirit, but it sure isn’t Jesus; it sure isn’t the Gospel; and it sure isn’t the Holy Spirit. There is another Jesus, another spirit, and another gospel. And they have nothing to do with the real Jesus, the real Gospel, and the real Spirit. All the way back in the times right after Jesus rose and went to Heaven, there were already people coming claiming to preach Jesus, and it was another Jesus, a false Jesus. There is and always has been another gospel, which is really just a corruption of the truth. But today it seems that it has increased or at least the publication and spread of it has increased. There are “Christians” today that say it is okay to sin because Jesus has already forgiven us of our sin. There are “Christians” that say you can live however you want with no need to change because Jesus loves us just as we are. There are those who say there are no guidelines to get into Heaven because a loving God would never send anyone to Hell. But none of this agrees with the Bible. The Bible is the rule book of life. It is the “Constitution of Christianity.” You live your life by what the Bible says, not by what your feelings say, not by what you see, and definitely not by what someone says who has no clue who God is. Too often Christians – real sincere, Bible-believing Christians, give into the pressures of the world and compromise what they believe because the oppression from people and the devil is so great. Lord be with them. Many years ago, while attending college, there was a girl in my drama class that liked me. One of her friends came up to me and told me that she liked me and I should ask her out. In the kindest way I could think of, I declined the offer and told her that I was a Christian and that I only dated Christians. Well, the end of the world came. This girl went off on me with all the fury possible for her friend. She told me that I was mean and stupid and all sorts of other things because I wouldn’t date her friend, as if any of that would change my mind. I stood there, endured it, as she stormed off. Though I felt bad, because I didn’t want to hurt anyone, I didn’t let her words or thoughts or actions determine my choice to do what the Bible says. Today we have so many people allowing others and their opinions to influence how they live. We have celebrities that open their mouth and type a stupid tweet and get so much backlash that they apologize, when in reality, the only thing they are sorry for is that people got mad at them. They still feel the same way. They just don’t say anything. The devil does the same thing to Christians. They stand up and do the right thing and then the devil comes by and influences someone to attack that person so they will compromise their beliefs and actions. Don’t do it. You have Christians today, God bless them, that are allowing the devil to tell them how to be a Christian. The devil will use people, just like he used Lady Gaga, to tell Christians that they’re being Christians wrong. He’ll tell them that they need to act this way or say this or do this. How would they know? Years ago in college (a different college), I was taking an English Lit class and during the semester we looked at the Bible as literature. The whole class had to write a paper on any subject they chose that we covered in class, so I chose to write about one of the parables of Jesus. I studied the Bible, looked at commentaries, and prayed about what to put in the paper. When I got done and handed it in, I was happy. I turned in a good paper, or so I thought. When we got the papers back, everyone had to sit down with the teacher and discuss their paper. During my discussion, she told me that she had taken a class on the parables of Jesus and that my paper was all wrong. She gave me a “C” and went on and on about what she learned in her class that made my ideas wrong. Even though my ideas were scriptural, accurate to history, and accurate from hearing from the Lord, this non-believing teacher told me that I was wrong. I didn’t take offense (too much). It didn’t change what I believed or how I lived. This is what happens every day, to a greater degree though. We have non-Christians telling us Christians how we should live. There are only two families in the world. There’s God’s family and the devil’s family. If you’re not in one, you’re in the other. So we have a bunch of the devil’s sons and daughters telling God’s kids how we should live. This is worse than the quarterback in the Super Bowl taking coaching tips from the guy at home in his Lazy-boy. Don’t fall for the trap. Don’t allow the devil to tell you how to live. Don’t allow the world tell you how to be a Christian. Now, just so you don’t get crazy, if the world just happens to get one right and tells you something that agrees with the Bible that you aren’t doing – do it. However, know it is the Bible telling you how to live. They just got “lucky” and got one right. It happens every now and then. I encourage you, stand strong, stand tall. Don’t compromise the Word. We determine what we believe and how we live according to what the Bible says – not by what anyone else says. Remember that the disciples, when John and Peter were released from prison, prayed that the Lord would give them boldness to preach His Word. You can do the same, believing that the Lord will give you the boldness to stand for Him when people come against Him – and you. 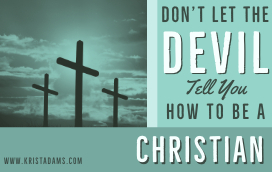 Don’t let the devil tell you how to be a Christian. Stay with the Word and the Spirit.